I don't know how Weigle's has managed to trap someone's grandmother and her secret chocolate chip cookie recipe in a kitchen somewhere, but I hope they never let her go. My son began bringing these home a few months ago and they're addictive! 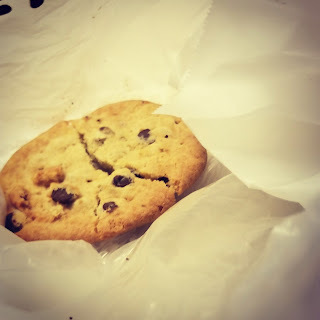 This is the best cookie I've ever had; hands down; and I've had a lot of cookies! I'd ask them for the recipe but I don't think I'd do it any justice. "The more I make it pose for this photo, the weaker I get! I typically know who my friends are, but I can't decide if my son is for or against me at this point. But what I do know is that I'm feeling particularly weak. I said, "no", but he tossed it to me. I counted calories all day and exercised. Good thing! Nom nom, SO many nom noms right now!"